Using maps helps citizens quickly visualize and understand what the government is doing in the areas that are important to them. The ability to take data, put it on a map, and serve it dynamically over the Web is very stimulating. 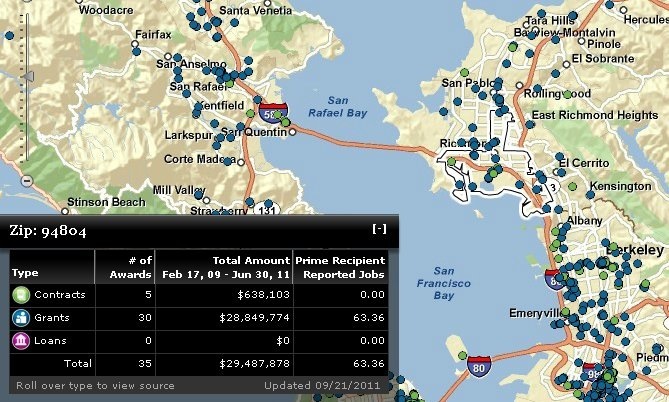 These web intelligent maps are leading the way for citizens with limited or no GIS experience to interact and explore government information through dynamic mapping applications. The recovery.gov mapping app lets people visualize recovery projects in their neighborhood. At the U.S. Recovery Board web site (recovery.gov), people can visualize American Recovery and Reinvestment Act data—they can see where a recovery project is located in their neighborhood, and instantly understand the context (i.e. it’s near the school or in a particular neighborhood). They relate the projects to their own experiences, many of them organized in their mind spatially. In some cases, they may see problems with a project, which they can report back to the government. Taking transparency and accountability a step farther allows us to actively participate in shaping our communities. The strongest movement impacting our daily lives on a personal level is the rise of citizen engagement through social media and mobile devices. Today, citizen engagement apps enhance a variety of government-citizen interactions involving public information, requests for service, public reporting, citizen-as-a-sensor, unsolicited public comment, and even volunteerism. For example, Singapore’s One Map combines web and mobile apps for an enriched citizen experience. In addition, Colorado and Oregon provide examples of how state-level governments are using spatially-enabled apps to achieve transparency and accountability. Maryland is expanding transparency and accountability by opening up participation in state planning efforts with SmartGrowthMD. And broadband mapping is a popular web app that allows the public to visualize broadband and comment on the planning of the nation’s infrastructure, as we have seen with BroadbandStat in South Carolina, Tennessee, Nevada, Ohio, Michigan, and Minnesota. Online redistricting apps give people a voice in the redistricting process. There is possibly no better example of citizen engagement in government than participation in the political redistricting process. 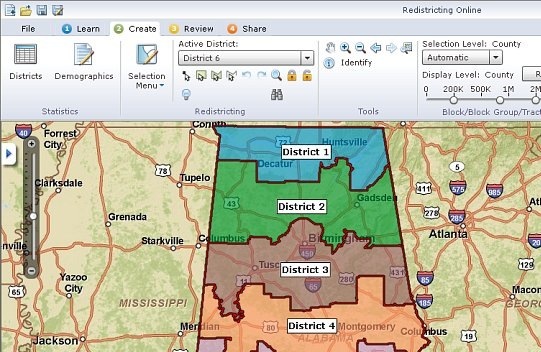 The State of Alabama and the County of Los Angeles are two governments that have led the way with cloud-based redistricting tools, where citizens interact with mapping data and submit ideas and comments for consideration in the final redistricting plan. Geospatial technologies have already proven to be effective tools in responding to transparency, accountability, and citizen engagement demands. Intelligent web maps are acknowledged as a catalyst for solving key challenges in creating a dialog through informed citizens. As web and cloud-based GIS continue to evolve and social media and mobile devices become more pervasive, governments will continue to deliver innovative forums through interactive information and participatory citizens applications.